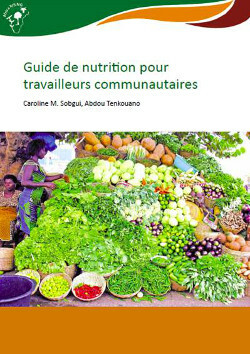 This document is a working guide for the agricultural and health extension workers specifically in Mali where Africa RISING is currently implementing different agriculture- and nutrition-focused research activities. It is meant to help them to improve their knowledge, skills, and nutrition practices to ensure greater returns on investments in agricultural research for nutrition and health impacts. Both agricultural and health extension workers play a crucial role in this process because they are in constant contact with the communities. They therefore directly influence decisions made by smallholder farm families; for example, which crops to grow, the correct agronomic practices, foods that are nutritious, and how to ensure the family consumes healthy or balanced diets. Having the right information goes a long way in assisting the communities to achieve better nutritional outcomes. This guide is meant to help them in this role especially on the correct nutrition for young children and pregnant and lactating women.